Eurodollar is still being corrected; price has already reached local correctional level of 38.2% and right now is trying to rebound from it. I’m waiting for bears to return and keeping my pending sell order, which is placed a bit lower that local minimum. 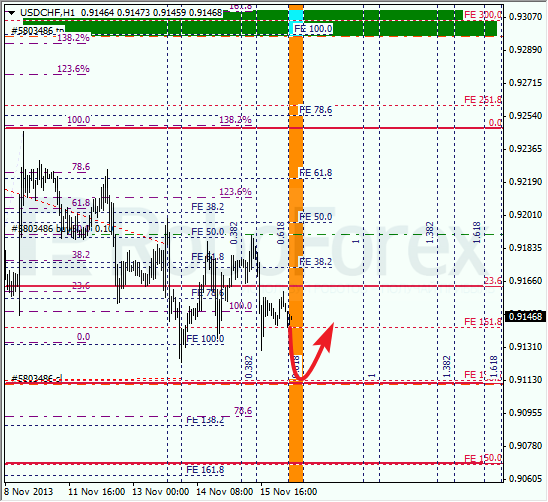 As we can see at H1 chart, pair is reaching one of temporary fibo-zones, which means that it may reverse during the day. Target for bears is still lower area, where there are several fibo-levels. Franc is moving inside flat pattern. Possibly, pair may reach 38.2% during the day. If later price rebounds from it, bulls will take control over the market. At H1 chart we can see, that Franc is getting g closer to one of temporary fibo-zones. During the next several hours, pair may break local minimum. If market break 38.2%, pair will continue current correction.